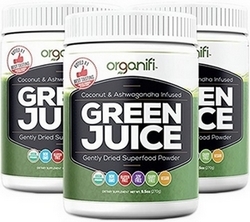 Organifi Green Juice Review – Real Superfood Supplement? Is Organifi Green Juice The Best Green Drink? At any given time, we are all looking for a convenient and comprehensive solution for keeping our health in check, especially when it comes to diet and necessary nutrients. Just take a trip to a local health food or supplement store, and you’ll see all manner of “healthy” products claiming to offer a variety of boosts and improvements to your body. Often, promises are unfounded, and there’s hardly any viable content or ingredients to back up the claims of these substance makers. That, or you later come to find that some of the ingredients are more harmful than they are helpful. In short, you’re pretty much gambling with your money, health, and time. Surely, there’s a more promising supplement out there? One relatively new product that has grown popular in recent years is the idea of a green juice or superfood drink, but what is a green juice exactly? Well, it’s a drink that can provide any and all-natural nutrients your body needs. By consuming the single drink, you can make up for a sub-par or unbalanced diet, provided you remain active and relatively healthy physically. Organifi Green Juice is one such drink. This organic green juice comes in powdered form, contained within a plastic bin. You scoop the powder into a fluid of your choosing – such as water – and then stir. According to the company, their beverage includes enough ingredients and nutrients to improve your body in many ways, including a general health boost, stress reduction, detoxification, rejuvenated and healthy skin, increased immunity strength, and the ever-popular energy boost. As the name and product label would have you believe, Organifi is comprised of 100% organic ingredients and offers nearly 10 grams of sustenance per serving. Purportedly, it is made of superfoods only, meaning there are no additional components or substitutes to worry about; nothing hidden or shady. There are no artificial sweeteners either, and it’s gluten-free. There is a 30-day risk-free trial from the main site here. Who Is the Ideal Organifi User? These types of green and powdered drinks tend to be for sports enthusiasts, health professionals, and extreme health nuts or anyone looking to stay in top form. Meaning, it’s difficult to find a drink that’s suitable for everyone, of any size, age, or demographic. But Organifi fits the bill there. I personally am overweight and turned to this product to drop the pounds. So far so good. Honestly, it’s for anyone; everyone. Anyone from kids, to the middle-aged, hyper-busy professional can whip up a batch of the drink in seconds and gulp it down. More importantly, once you start consuming it regularly, you’ll find yourself a lot less hungry, eating smaller and healthier portions. Yes, it tastes that good that even kids will love it, which is surprising. Plus, smoothies and green powdered drinks – like Organifi – are much healthier than off-the-shelf juices with lots of preservatives. Even if you have no interest in the benefits of the beverage, you’ll still be improving your overall health, and it’s a good alternative to unnatural juices and drinks. Look, let’s be straightforward with one another. 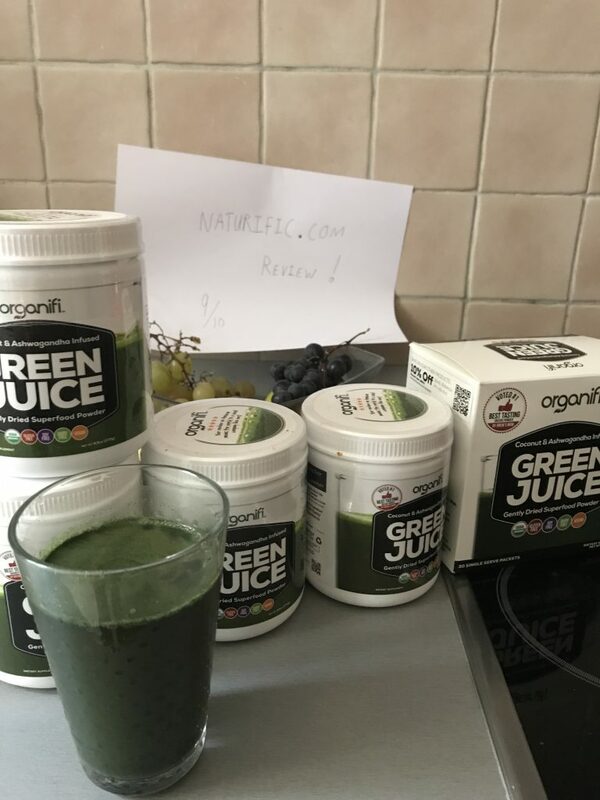 You’re not going to read this review – or any review (there are plenty of green juice powder reviews out there) – and immediately whip out your wallet, at least not without doing some further research and thinking. That’s cool, that’s not our intention, and it’s not why we’re writing the review. What you need to know if you’re only going to skim this whole thing, is that Organifi Green Juice offers a variety of benefits, tastes great, and is easy to mix – and quick too. More importantly, you will begin to feel better almost as soon as you start using it, we sure did. But even if you don’t believe us, which is perfectly fine, or anyone else that has praised the beverage, there is a 30-day no-risk trial. You can order your first shipment and give it a try, before spending anything substantial. We recommend reading the rest of the review for more in-depth information, but if you’re not going to why not at least take advantage of that free trial? We did, and it led to a stable subscription, and we do not regret it. What Is Organifi Green Juice and Why Should You Care? 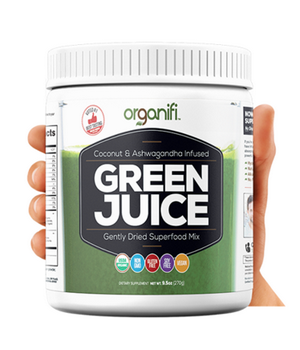 Organifi Green Juice – from Drew Canole of FitLifeTV – is a “gently dried superfood mix” that is infused with both Coconut and Ashwagandha. Several elements of the green drink include non-GMO ingredients, gluten free, soy free, and vegan-friendly components. Also, everything contained within is 100% certified USDA organic and natural, but does it make it best green superfood powder? We’ll try to answer this question here. It takes a maximum of 30 seconds to blend and mix the drink and offers a variety of health benefits from mental clarity, to boost immune function. Some of the more prominent ingredients in the drink include Chlorella, Moringa, Spirulina, Mint, Beets, Wheatgrass, Turmeric, and more. These ingredients each provide a series of benefits that are sure to boost your health and keep you feeling happier, more energetic, and more alive. Of course, like any similar green drink, these claims are nothing new. Is it indeed possible that a drink such as this can provide everything you need for your body, let alone the advantages and benefits laid out here? The short answer is yes, and as most reviewers claim – including us – you will feel much better just weeks after you begin regularly drinking the Organifi. The better testament is whether or not some of the prominent ingredients have been shown to offer improvements through actual studies and scientific analysis. Ashwagandha, the leading ingredient, is referred to as an adaptogen. It comprises a healthy mix of amino acids, vitamins, and reliable herbs, all of which can help reduce stress and improve general health. Adaptogens often remove and filter toxins and internal stresses, helping you live a happier, fuller life. Then there’s Turmeric, a powerful antioxidant shown to fight select forms of cancer and disease. As well as coconut water, a natural refreshment that is high in potassium assisting with more natural and better blood flow throughout the body. As you’ve seen, however, these major ingredients are not the only ones that provide benefits, and that’s an important distinction to make. Rather than just hear a bunch of users and customers tell you the juice makes them feel better, you can dissect some of these ingredients to see the benefits for yourself – before ever buying the drink or ordering a sample. The good news is if it seems like too much of a risk for you, even now, the company offers a 30-day risk-free trial. You can order the drink and give it a try, to see how it affects your body, energy, and health before spending anything. Another welcome thing to note is that, while at first, the drink may not seem as tasty as you’d like, it grows on you quite a bit. More importantly, it is one of the better tasting green juices we’ve had the opportunity to try. Give another brand a try, and you’ll notice immediately how bland and uninspiring the taste and texture can be. Organifi tastes great is sweet enough to keep you coming back, but still all-natural and healthy for you. Although, it would be nice to have seen probiotics and enzymes added in for that extra immune boost. There are no additives of any kind, which is mostly good, slightly disappointing as we’ve pointed out. All in all, though, it’s a super healthy, alluring, and convenient drink for anyone interested in this kind of thing. The container the mix comes bundled in is quite portable. That said, they do also make an ‘on the go’ size as you can see from the box in my picture above, these are great if you’re on a long flight and want to get some nutrients into your body. When you consider the 3 options you have, this is an excellent drink with many health benefits, that’s sure to please everyone who gives it a fair shot. Hands down, the biggest hurdle for you – or any new Organifi user – will likely be the price. But, just take a look at all the ingredients it includes, and you’ll also notice how much more it has to offer. Then compare it with the cost of a cold press and the time saved from doing it yourself you will quickly see why it is my preference. The base subscription, at one bottle per month, costs about $57.95. From there, you can choose up to three bottles per month for $149.95, or six bottles per month for $249.95. Of course, shipping is not included so you’ll have to pay for that too on top of the quoted prices. That will vary depending on the region and country where you live, obviously. While the packaging itself isn’t as portable as we’d like, the mix itself is super easy to use, anywhere. In fact, one of the better experiences was making this drink wherever we were, out for lunch, out shopping, at home, at the gym, and anywhere else we fancied. It’s perfect for travel too because it only takes about 30 seconds to thoroughly mix the drink in a suitable container. Preparation is super easy. Just add a single scoop to your fluid; be it water, low-calorie rice or almond milk. Then, simply stir, and you’re ready to go! You can also add the mix as a boost to other smoothies and drinks that you’re preparing, just as you would with protein powder or similar combos. One bottle contains up to thirty servings of the beverage, and the recommended consumption for adults is two servings a day. That means if you’re drinking it as recommended, a single bottle will last for about 15 days or so. You don’t get unmixed clumps or gross chunks in the drink either. It mixes super well and efficiently, which if you’ve ever used a green juice like this before you’ll know, is awesome to hear. It also tastes pretty good cold or warm. The texture isn’t abhorrent either, in fact, it’s quite pleasant. Mixed drinks often have a chalky, almost residual element that leaves you feeling a little gross even after you’ve swallowed. Organifi does not have to be washed down with another drink, and it’s a great experience all around. In the picture above you can see I just add water and sip it as a drink. If you’re looking for something that mixes quick, mixes well, and can be used in just about any form – cold or lukewarm – anywhere then Organifi is the way to go. The customer service and support team at Organifi is fantastic and responsive. During our experience, the longest it took to get in touch with a rep was about fifteen or twenty minutes over the phone and less than a day through email. They were always courteous, helpful, and pleasant to interact with. No, we did not disclose that we were writing a review or making a note of our interactions, which makes it all the more relevant. If you want to cancel an order, report a problem, or update a subscription there are only a couple of ways to do so. You can either email the support team or call the official hotline. Calling over the phone is pretty much exactly what you’d expect, but luckily, it doesn’t take long to get in touch with an actual human representative. Through email, it takes a little longer to get a response, but compared to other support teams, Organifi’s is certainly reliable. The most important thing to note, however, is that should you have any issues you can have the problems remedied promptly, and the same applies to any questions or concerns you may have. Should You Buy Organifi Green Juice or Not? And now we come to our conclusion, the part of the review where we either recommend or turn you away from the product. Is Organifi the best green powder? Is it worth your money, especially since it’s a little pricier when compared to similar products? Will you see any results, and is a subscription – for regular shipments – warranted? Unequivocally, yes. You will notice a happier, healthier, maybe even spunkier you, within the first couple of weeks of drinking the juice. We certainly did, and it made us feel as though we finally landed on something that’s not just a placebo. It works, and it makes you feel great. Now, it’s not a dietary or weight loss supplement, so don’t expect to shed a ton of poundage when you start drinking the juice. You may shed some weight naturally, but that’s likely because the juice is expelling toxins and bad chemicals from your body. Still, you will come away feeling healthier, more active, and more, well, you. We certainly have splurged on the regular subscription, and will continue to use Organifi into the future. It’s that great. It might even be the best green drink powder out there at the moment. If it sounds promising to you, feel free to give it a shot by ordering here, one of the best places where can you buy green juice, in our opinion. Alright, so you’ve poured through the review, and while Organifi sounds promising, you aren’t quite sold on it. There are so many green juice reviews out there… No problem. Being skeptical is not a bad trait, it’s a good one, especially when it comes to products like this. So, naturally, you want to hear about a few alternatives to what we consider the best green food powder so you can check them out before making a final decision, right? We have you covered. 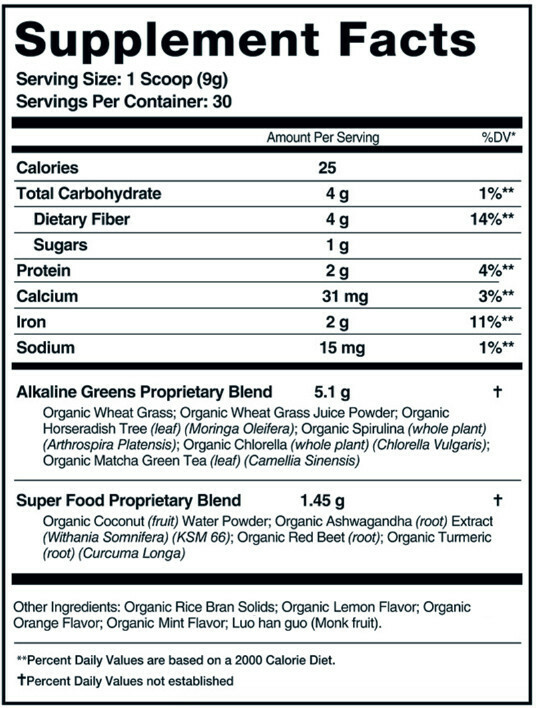 Amazing Grass: Organic superfood mix with similar ingredients to Organifi, though boasting separate results. I liked this one too, based on ingredients and taste, I prefer Organifi, but this also gets around an 8 or 9 out of 10 from me. Green Vibrance: A direct competitor of Organifi, offers many of the same nutrients and ingredients with a few differences. So for me, almost hands down, and also because I really love the subscription model to keep my drinking my juice, as well as the organic ingredients that make a noticeable difference to my general well-being and mental clarity, I simply must say that Organifi Green Juice is my choice for drinking twice a day. Definitely one of the best green drinks out there! When it comes to home remedies, there are very few that beat aloe vera. Aloe vera is a plant of the lily family that was initially native to North Africa. It has now migrated to many different parts of the world and for people who know how useful it can be in treating some of the most common conditions, it is an invaluable plant. Before we talk about the uses and benefits of aloe vera, let us first see how it grows and what it looks like. Aloe vera grows best in warm and dry conditions. It grows in the wild and it can also be grown in the home, either in the garden or in a pot. If you ask most people who know it, they will tell you that it looks like the sisal plant. Some will even tell you that it resembles a cactus and they wouldn’t be wrong. The leaves of an aloe vera plant usually grow to between 80 to 100 cm and they have little thorns along the edges. The leaves are also succulent – if you break one open it will flow with a yellow juice and there is also some gel. Aloe vera is packed full of ingredients – more than 200 – that are beneficial in healing and restoration. They include minerals, enzymes, vitamins, amino acids, fatty acids, polysaccharides, fatty acids and more. All these are packed into the gel and constitute about 1% of the gel. The rest of it is just water. Aloe vera is very easy to extract. You can extract either the gel or the juice. To extract the juice, just break a leaf and leave it to stand in a cup. The juice will flow out slowly depending on how succulent the leaf is – some are so succulent that you can have a tablespoon of aloe vera in less than a few minutes. The same leaf that you have drained of juice also has aloe vera gel. Just take a spoon and scrape it off into a cup or a plate. Both the gel and the juice can be used directly on the skin and for those who can stand it, a little bit is recommended for intake; that is because aloe vera has a very bitter taste that lasts for quite a while. There are so many different uses of aloe vera that it is hard to list them all so let us list as many as this article will allow. Considering how effective aloe vera is in treating eczema, it is a shame that dermatologists don’t recommend it as a solution to sufferers. To treat eczema with aloe vera, you can apply the juice of the gel directly to the skin. You can also boil some leaves and use the dark brown water in your bath. The skin and the gel applied directed will sting for a few seconds, but it should be left on for about 10 or 15 minutes and then rinsed off. Apply a mild moisturizer to the area. If you treat eczema this way for a while, it will go away. It can also be used on kids without any side effect; make sure none of it gets in their mouth though; the bitter taste can make them cry. Do you want your skin to feel silky? Take an aloe vera bath; boil the leaves and then use the water in your bath. Sit in it for about 20 minutes and you won’t believe just how smooth your skin will be. If you want to keep it this way, have these baths often. If you wake up in the morning and you have a headlight in the middle of your head, a touch of aloe vera juice or gel will help the pimple to pop faster. Depending on how potent the plant you use is, the pimple could pop open in just a few hours. It also works in the same way on boils. As soon as you notice that one is developing, apply the gel every few hours and it should burst before long. One of the most effective home remedy for all kinds of burns is aloe vera. As soon as you get burnt, apply some juice or gel and let it dry. It will take away the sting and it helps the burn heal so well that there is hardly any scarring. Keep a small aloe vera plant in a pot on your kitchen window for just this. It works on major burns as well, but let a doctor treat you first to make sure that you don’t get blood poisoning. Yes, that maddening disease that makes children scratch and scratch. As soon as you notice that they are developing chicken pox, boil some aloe vera leaves and wash or even wipe down your child using a small towel. The scratching should go away, there will be fewer bumps and there will be very little scarring if any. If you have a wound, a little aloe vera juice or gel should help it heal a lot faster than anything the doctor can give you. Make sure that you disinfect the wound and then wash the leaf before breaking it open so as to avoid infection from any dirt that may be on the leaf. Aloe vera is a great digestive cleanser. It also helps with both diarrhea and constipation because it contains an ingredient called adaptogen. Adaptogen helps the body fight illness and also adapt to changes. Aloe vera is also known to help with acid reflux and IBS and it helps get rid of unfriendly bacteria in the gut. It would be quite hard to eat the gel or drink the juice directly as it is very bitter. For those who can stand it, a few drops of the juice in a bowl of soup are beneficial. If you cannot take it this way, there are commercial versions that are sweetened. 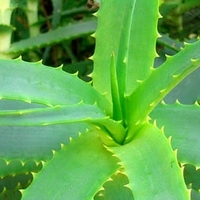 There are many versions of aloe vera extract in the market, but not all of them are very good. Before you buy, contain just how much extract the product contains. Also, look at reviews of the product and see how other people feel about it. You can buy aloe vera plants online. If you take this option, make sure to find out how the plant is packaged for shipping. Some companies that sell them don’t package them well enough and by the time they arrive, the leaves are broken. The uses and benefits of aloe vera have been known for centuries. It is effective for treating more than we have talked about here. Get yourself a plant, but if this is difficult for you, make sure that you always have some commercial formulation of the gel and aloe vera supplements to keep you in good health. Pasta, apart from being one of the cornerstone foods of the Mediterranean diet, is a great favorite because it requires so little time to prepare. It also comes with great health benefits: it is rich in carbohydrates and fiber, it has selenium and manganese and it also has folate and carotenoids. Pasta is eaten with an accompaniment so you have to be careful to choose those that are low in calories if you want to have a healthy meal. There are plenty of pasta recipes that you can make, but let us look at 7 that are healthy and that are also very easy to prepare. It is important to note that there are different kinds of pasta – spaghetti, macaroni, noodles and penne are just examples. All these are ingredients that you can find easily in the supermarket. 1. Cook the penne as directed on the packet. Before you drain, save a cup of the water. 2. Pat the shrimp dry and season with the salt and pepper. Using a large skillet, heat 1 tablespoon full of the olive oil. Add the shrimp and cook until pink in the middle. Put on a plate. 3. Heat the remaining olive oil, add onion, garlic and fennel and season with salt and pepper and then cook until golden brown. 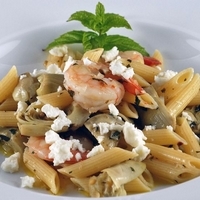 Stir in wine and tomatoes and then stir in the olives, shrimp and penne and then add the reserved pasta water to lighten the paste. Serve, sprinkle with the feta and oregano. For those days when you literally have just minutes to prepare a meal, this recipe is just perfect. 1. As you are boiling water for the pasta, heat the olive oil in a heavy skillet. Add garlic and cook for 30 seconds. Add the red peppers and stir for about a minute. Season with salt and pepper and stir in the basil and the cheese. 2. When water is boiled, salt it and then add the pasta. Take out a cup of the boiling water and add it to the red peppers and stir it in until the cheese starts to melt. Drain pasta. Your meal is ready to serve. This is also another very easy pasta recipe and it is filling and healthy. 1. Cook the spaghetti as directed. Before you drain, take out half a cup of the water. 2. Grate the zest from the lemon and squeeze out the 2 tablespoons of lemon juice. Trim the asparagus into ribbons. 3. Still in the pot, toss the spaghetti asparagus, lemon zest, lemon juice, cheese, salt and pepper and add enough of the spaghetti water to make a thin sauce. Your meal is ready. You can grate a little more parmesan to sprinkle after you serve. Pasta can also be enjoyed as a salad, so try this out. 1. Cook pasta as instructed on the package. Reserve ¼ cup of the pasta water, drain the rest and run the pasta under cold water. Return it to the pot. 2. Put the pesto and 2 tablespoons of the pasta water in a bowl and whisk. Put it into the pasta together with the tuna (drained), olives and black pepper. Toss. Your salad is ready to eat. This recipe is also easy to prepare and takes very little time. 1. Cook the pasta as directed on the packet. 2. Put tomatoes and beans in a non-stick pan. Boil over medium heat and then reduce the heat and simmer for 10 minutes. 3. Add the spinach and then stir continuously for 2 minutes until spinach is wilted. 4. Serve with your favorite pasta sauce and sprinkle some feta cheese. Ziti is one of the most common pasta meals among Italians. Try this recipe and find out why they love it so much. 1. Cook the ziti pasta as directed on the package and drain. 2. To make tomato-pesto sauce, mix the pesto and basil pasta sauce in a pan and stir. Leave it to simmer and add salt to taste. 3. Toss the pasta with the tomato-pesto sauce. 4. Serve and sprinkle with parmesan cheese. We haven’t tried pasta with chicken yet, so here you go. 1. Cook penne as directed on the packet. 2. Heat oil in a skillet over medium heat. Add garlic and cook for 1 minute. Add the chicken and cook for about 8 minutes each side. When almost ready, add the spinach and stir until spinach wilts. 3. Prepare alfredo sauce as directed on packet and stir in 2 tablespoons of pesto. 4. Add the chicken and spinach to the pasta and stir in the mixture of alfredo and pesto. Serve and top with the grated cheese. There! 7 healthy pasta recipes that you can make in just minutes. Bon appetit! There is always something new on the market, a wonder oil or treatment that promises to change the way we look after ourselves, and very often these tend to be passing fads. Those that last are the ones that do provide a solution, and usually it is as a natural alternative to chemically derived products. One that has stood the test of time is Jojoba oil, and it remains among the most useful n versatile beauty and cleansing products on the market. Jojoba oil is derived from a specific shrub – the Jojoba plant – which is found naturally only in Arizona, Southern California and parts of Mexico. The oil is found in the seed of the Jojoba plant and is now regularly farmed and refined. In its unrefined form Jojoba oil has a slight nutty aroma, but once refined for sale and use it is practically odorless. It is a proven safe product, and one that has many used. Its popularity stems entirely from its versatility as a skin cleanser, but there are many more uses for the product. 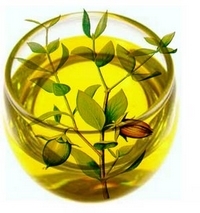 Let’s have a look at the uses of Jojoba oil, and why it has become so widely sought after. Jojoba oil is highly regarded in beauty circles as an agent for cleansing the skin; its natural properties and lack of chemical additions mean it is soft and gentle on the skin, while cleaning effectively. Jojoba oil is widely used as a natural make up remover – just a few drops on cotton wool are enough to allow for efficient use – and also, in the same way, for cleaning the skin. It is particularly useful to people with dry skin, as its natural moisturising properties are well known. The oil is also used for keeping the hands and feet soft and healthy, as it allows the pores to remain clean and breathe effectively. Used after a bath Jojoba oil helps keep the skin and pores clean and healthy and is a soothing addition to the skin. One of the most important aspects of Jojoba oil is that it has no fragrance; fragrant oils are often used in massages but, in fact, they are not the most effective. This is because fragrances in oils are often caused by chemicals which are not kind to the skin. Jojoba oil is the perfect massage oil, being kind to the skin and leaving the pores refreshed and skin well-oiled and soft; it is used widely by professionals, and is equally used in the home. For a full scalp massage, an enjoyable and life-enhancing experience, Jojoba oil makes perfect sense and has the desired effect, leaving you relaxed and refreshed after your massage. For the same reasons the oil makes an excellent addition to any bath, and can be used in showers too. The natural properties in Jojoba oil also make it an ideal hair conditioner. Take a small amount of Jojoba oil – it is potent so large amounts are not necessary – and concentrate on massaging it into the tips of the hair. The trick is to leave it for a good few minutes to work its magic. Once satisfied, shampoo the oil out and it will leave the hair smooth, soft and protected. Some people leave the oil in, having massaged it into place after washing, and this can have the effect of smoothing the hair if it has a tendency to be lively. Massaging Jojoba oil into the tips of the hair also helps with split ends. Another use for Jojoba oil with the hair is in protecting it from the chlorine and salt that can be found in swimming pools and the sea; a small amount applied before entering the water can be very useful indeed. Jojoba oil is very kind to the skin, especially in the sensitive areas, which makes it extremely useful for people who have dry lips. If you use a lip balm regularly you may find it is chemically formulated: Jojoba oil is entirely natural, and makes for an excellent lip balm substitute, especially when used as an overnight treatment. Furthermore, rough or dry cuticles also benefit from the soothing effects of Jojoba oil, and it is known to protect nails too. Used at least once a day it can be a very useful element for nail and skin care. It is not only the ladies who can benefit from the many properties of Jojoba oil: men with dry skin or and troublesome hair can also use this wonderful oil in the ways described above, but it is also very often used in shaving. Used in conjunction with – and beneath the regular shaving cream it has the effect of softening the skin, allowing for smooth and trouble-free shaving and less chance of razor-burn. The effect of soft and smooth skin afterwards means a shave that is closer than ever before. Add to the skin after shaving to make sure the skin remains soft and perfectly conditioned. If you use a favorite essential oil – Tea Tree oil, for instance, or Lavender – mix in a few drops of Jojoba oil for added soothing effect. The Jojoba is a perfect carrier, being odor free and natural, and helps to bring about the overall smoothness and softness you desire. Jojoba oil really is a very versatile and usable product, and its natural origin makes it much more applicable in beauty and health terms. For people with very dry skin it can be used to help alleviate the problem, and there have been instances of eczema sufferers reporting it to be helpful. Whether you use it as a bath oil for that added soothing effect, as a massage element or simply as a skin cleanser the benefits are many, and we can’t stress how much the natural origins of this oil make it an appealing product. Try Jojoba oil for yourself, and reap the benefits of smooth, soft skin, clean open pores and the soothing effects all round. One of the most versatile of all foods, Tuna is often presented in a bland and uninspiring dish. Delicious when prepared correctly, it can in fact make some of the most impressive meals around. We took a look at the best canned tuna recipes, each of which is healthy and tasty, let alone easy to make. For those on a budget, these may be the most helpful recipes around! Cooking is simple: boil the pasta as per the instructions, stirring in the carrot and tomato, parsley, and salt and pepper. It will take no longer than ten minutes, after which you should drain the pasta and then add the olive oil, stirring to coat. Choose whether to have the salad cold or hot – it’s up to you – add the tuna, and serve. There really are few recipes as easy as this: preheat the oven to 375f and while doing so wrap the potatoes in foil. Bake for an hour, and then spilt the potatoes and take out the filling while taking care not to damage the skin. Mix the ingredients in with the potato, replace in the skins and sprinkle on the cheese, then bake for 20 further minutes for a truly delicious meal. Mix all the ingredients together thoroughly in a large bowl, adding salt and pepper to taste, while toasting the bread lightly under a grill. Spread the mixture on the un-toasted side of the bread and return to the grill, adding a slice of cheese on top if you wish. Grill for three minutes and serve. Mix all the ingredients together in a large bowl, and when ready, shape them into burgers. Some choose to add breadcrumbs for consistency. Heat the olive oil on a medium heat in a large skillet, and add the burgers. Cook on both sides for five minutes each, being careful when turning. Serve on buns with lettuce and tomato. Perfect for anyone looking for a healthy and tasty lunch or a dinner party side-salad, Salad Nicoise is a simple dish to make and will be enjoyed by all. Mix the oils and the garlic in a bowl, place the lettuce as a bed and coat with the dressing, arrange the rest of the ingredients in the bowl and add the remainder of the dressing, and serve as required. This is simplicity exemplified: preheat the oven and coat the Pizza bases in olive oil; spread the tuna, tomatoes and cheese over the crust, cook for fifteen minutes and serve. Simply mix the ingredients together and spread on the rice cakes. Substitute bread for rice cakes if preferred, and also consider other spices and herbs to make a superbly delicious sandwich. Drain the tuna and sweetcorn and mix together in a bowl; stir in the mayonnaise, spread on the crispbread or buns and season to taste. For an alternative, substitute tomato for sweetcorn, and maybe add a touch of garlic. What could be simpler? The above eight recipes are just a few of the many different ways that a can of tuna can be made into a delicious meal. Use these as your template and experiment with other ingredients, and you will have a never ending source of tasty, healthy and very cheap meals. Almost everyone wants to be fit but somehow, it is always something that we are striving for rather than something we already have. We make the same resolution every year – this year I will work on getting fit – but somehow, we can’t seem to get to doing it. The good news is that it is like AA; do it one day at a time and sooner or later, it will become a habit. To get you started are 11 tips for getting you into better health. Don’t wait to get started; just do it. Fitness requires a lot of commitment. The way to look at it should be the same way that you make goals for your life. If you have ever set yourself a goal and you have achieved it, then you can get fit. Remember there is no limit to fitness; you cannot get to a place and then stop because you feel that you feel fit enough. If you do that, you will go back to being unfit. Once you commit, you have to keep going. It may sound like a big thing to commit to but always remember that you are adding years to your life through keeping fit. Most of us are very enthusiastic at the beginning of a fitness program. We want to do as much as we can to get as fit as possible. Believe it or not, 95% of quitters quit for this reason. Doing too much too soon will do two things to you: one is that you are not actually as strong as you feel right now, so you will experience fatigue faster than you think. Two is that you will harm your body by doing this. When you put too much strain on your muscles, they tear. The result is pain, and pain will discourage you. Getting fit is a gradual process. You start with what your muscles can take and then gradually increase your exertion. It is not wise to pick up a 10 pound dumbbell on your first day and it is not wise to run 3 miles the first day. Start with what you feel you can naturally handle and not what you can challenge yourself to do; that comes later when you are primed. The proper way to exercise is to strain the body and then give it time to heal. This is what forms muscle. When you exercise, you strain your muscles and they need to recover if you are going to be fit. Also, this is what helps your body eventually adjust so that your heart and your lungs can perform optimally for the kind of exercise that you do. It doesn’t matter what kind of exercise you do, whether you are training to be a body builder or whether you are looking to just lose a few pounds; you must allow periods between workouts for the body to recover. Letting your body heal does not mean that you completely keep away from exercise. The idea is to get rid of extra calories that we consume so try and do some exercise every day. Take the stairs instead of the elevator. Walk to the store. Play outside with your children. Take a long walk. All these are examples of how you can stay active as you allow your muscles to heal. In the first few weeks you exercise, you try different things and you also discover which of these things works. 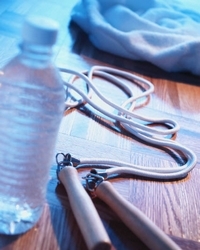 Use what works to come up with an exercise regimen or routine. If, for instance, you like to run on the treadmill, lift weights and swim, arrange those activities so that they form a kind of pattern throughout the week. The fitter you get, the more you can add to your regimen. Having a routine also helps you stay disciplined. Getting fit is a goal, so we have to track progress. You need to know if you are getting better and better at staying fit. You need to know how many calories you have lost, how many miles more can you run, how much additional weight can you comfortably lift? This helps you celebrate progress. True, there will be times when there will be no progress or progress will be slow, but don’t let this put you down. Be patient and stay focused. Don’t push yourself too much if you think you are not getting where you want quickly enough; it takes a while to get into shape. It doesn’t matter how much you exercise if you are eating the wrong foods. When you make the resolution to get fit, take some time to look at your diet and see what you should take out and what you should replace. Because you are working out, your body needs to be fed properly. You need foods that provide energy, so step up your healthy proteins. Eat whole grain and drink lots and lots of water. Hydration is important so carry a water bottle around and remember to drink often. Lack of sleep will affect your exercise routine just like the way it will affect other things in your life. It isn’t about going to bed early but rather getting the right amount of sleep for you to wake up refreshed. It helps if you can sleep and wake up at a fixed time every day. If something hurts, there is definitely something wrong. Don’t push yourself to work out when you are injured because that will only make your injuries worse. Joint injuries are especially sensitive because if they are not taken care of properly, they can get worse to the point where you can no longer exercise. It is recommended that if the pain continues for more than a day, seek medical advice. Exercising alone can be tedious and lonely and it can make you feel unmotivated. Find someone whom you can exercise with and also who keeps you accountable. If a trainer is not the answer for you, find someone who will do it with you. If you are a runner, for example, and there are other runners on your route, start a conversation about whether you can run together. You are healthy only when everything in your body is performing optimally. Get a doctor to verify this for you regularly. Don’t forget your teeth; they are a part of your physical self. Lastly, if you want to know that you are at that performing at your top aerobic activity, take the talk test: can you have a conversation with somebody while exercising and not lose your breath? If you can, whatever you are doing is working. If you are a believer in natural healing methods, you should seriously consider getting yourself some Manuka honey; it has considerable health benefits when it is eaten and when it is topically applied. Lots of people have used it successfully to treat infection. But what is Manuka honey and how does it work to heal infections? Manuka honey is a kind of honey that is produced by bees that feed off the nectar of the Manuka tree. Manuka trees, scientifically named Leptospermum Scoparium, are native to New Zealand and some parts of Australia. These trees flower in early summer and bees then feed on the nectar and then make honey in hives that are put out by bee farmers. The honey that is produced has high antibacterial properties. Generally speaking, all honey has antibacterial properties; it can be applied to wounds and eaten to reduce infection. What sets Manuka honey apart is its potency; it can be as much as 100 times stronger than other honeys when it comes to healing and fighting infection. Let’s have a look at honey in general when it comes to healing. Honey has been famous for its healing qualities since ancient times. When researchers tested it in the early 19th century, they were able to confirm its antibacterial properties. It works in two ways: it protects damage caused by bacteria and it also stimulates production of cells that reduce tissue damage. Remarkably, it also contains anti-inflammatory properties that reduce pain and inflammation in wounds. Honey is also great when you are trying to lose weight. A lot of the excess weight that we gain is as a result of eating sugar. A good alternative, if you still want to take your drinks sweet, is to use honey. A teaspoon of sugar contains more than 20 times the calories that are found in honey. What makes Manuka honey so special? All honey has hydrogen peroxide which in itself is used to fight infection. What makes Manuka honey different is the additional properties. It contains Methylglyoxal (MG) which aids in reducing infection and repairing tissue. MG is the result of the conversion of another compound, dihydroxyacetone. Even between Manuka honeys, you will find different concentrations of MG. This has led to the development of a scale, the UMF (Unique Manuka Factor) to measure the potency of Manuka honey after harvest. Research shows that its osmolarity and its pH also aid in healing. Different levels of MG in different honeys means that consumers have to be careful when they are buying. There are many honeys masquerading in the market as the real thing. Manuka honey for medicinal purposes has a UMF of 10 and above and it should be labeled UMF Manuka Honey or Active Manuka Honey. Some come with a UMF and a + sign. This means that the honey may be a little more potent than is indicated. The reason for this is that Manuka honey becomes more potent over time. In fact, all honey seems to increase in medicinal and health benefits the longer it sits. There are certain producers of Manuka honey who are known for the best product and they are certified by the UMF Association. Currently, there are 44 members, and their product has a UMFA sticker. If you can find Manuka honey with this sticker, you are buying the best of the best. – It can be used to treat certain kinds of cancer. That said, it should not be used in place of cancer treatment. – It is excellent for reducing blood cholesterol. – We already mentioned that it is an excellent alternative to sugar for those who are looking to lose weight. – It reduces inflammation and pain. – It helps diabetics maintain normal sugar levels. – Manuka honey, (and almost all kinds of honeys), are used for skin care. Applying honey to your face for 15 minutes will leave you with a smooth, soft skin. It also helps to reduce inflammation in the skin and it can help avoid pimples. – It is also used to condition hair and soften it. It helps get rid of dandruff as well. – It is used for sinus infections. It is also excellent for treating eye and ear infections. – It treats gastrointestinal conditions like diarrhea. The bacteria that cause diarrhea is very sensitive to honey – they die off almost right away. – It is used to improve physical endurance; people often carry it on walking expeditions and other such activities. It is also often used to help invalids get their energy back. – It is perfect for healing mouth sores when applied before bed. – An additional benefit of Manuka honey is that it doesn’t cause bacteria resistance unlike antibiotics. If you take antibiotics for a long time, you develop resistance to some antibiotics and it can be extremely problematic to treat bacterial infections. Manuka honey will kill bacteria without causing resistance. – A study showed that Manuka honey is effective in preventing gum diseases such as gingivitis; it works by reducing plaque buildup. – The National Cancer Institute approved the use of Manuka honey for chemo patients to reduce inflammation in the esophagus. Does science support the healing qualities of Manuka honey? Generally, research does not lend much support to natural healing methods and it is easy to understand why; if they supported the use of Manuka honey for the uses that we have just mentioned, for example, it would mean that people would not rely on medication. That said, research shows that Manuka honey is highly effective when applied to wounds and burns. There is contention as to whether it is effective for treating stomach ulcers. There are authorities that agree that honey, not necessarily Manuka honey, is effective in treating some conditions. According to the Natural Medicines Comprehensive Database, honey is listed as effective for treating burns and wounds. The Cochrane Review also states that honey is more effective in healing mild burns than traditional dressings. Although they don’t specify Manuka honey, they make the case for the healing property of honey. Because of the amount of MG in Manuka honey, it is easy to conclude that it is highly effective in fighting bacterial infections. Does Manuka Honey cause side effects? – If you are allergic to bees, you should not eat any kind of honey; you may risk an anaphylactic reaction. – People who are on chemotherapy should clear it with their doctor before consuming Manuka honey. – There is a risk of increased blood sugar in some individuals. To conclude, you should have some Manuka honey handy; you can use it every day in your beverages or you can use it for medicinal purposes only; either way, the benefits are great. It is hard to know where to start with salmon; not only are there so many different ways that you can cook it, it is chock-full of health benefits. It provides lots of omega 3 fatty acids which are excellent for heart and brain health, it helps the body cartilage to keep its form and it is also a great alternative for red meat – it provides protein without all the negative effects that come with beef. Chefs across the world have figured out different excellent ways to prepare salmon. Here are 4 top recipes that you can prepare any time. It is important to ask before whether it is farmed salmon or wild salmon. Farmed salmon came about when it the wild kind was over-fished so much that market demand could not be met. Farmed salmon, compared to wild, has a different taste. In fact, people used to eating wild salmon will refuse to touch the farmed stuff. If all you have ever had is the farmed kind, it may not matter much to you. You should also be careful about mercury levels – some waters that contain salmon have a very high degree of mercury in them, and this transfers to salmon eaters and can cause several different types of cancer. With that bit of background, let’s get on with the cooking. Although not conservative when it comes to calories, this is one of the best ways you can enjoy salmon and it takes just a few minutes to prepare. 1. Cook ravioli using the usual method. Most of it comes packaged with instructions. If you are not entirely sure, look online for how to cook ravioli. 2. Cut the lemon in half. From one half, squeeze the juice. The other will be used as a garnish so cut it into little wedges. 3. Rinse and pat dry the salmon and then set it on a board and sprinkle with salt and pepper. 4. Heat the olive oil in a skillet on medium heat and then put the salmon in. Cook for about 8 minutes; it will start to flake. The best way to cook it in one piece is to make sure that you turn it only once – cook 4 minutes one side, turn, and cook for another 4. 5. Remove the salmon and then put in the baby spinach on for one minute and remove. 6. Put garlic, lemon juice and butter on the skillet and cook while stirring for about 2 or 3 minutes. 7. Divide the salmon into 4, serve with the ravioli and then sprinkle the sauce that you have just made. Your salmon and ravioli is ready to eat. This is an excellent way to eat light and it also takes a short time to prepare. 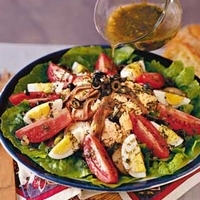 If you are looking to make your salads a bit more interesting, try this one out. 1. Put the salmon, the carrot, the fennel bulbs and celery and the apple into a bowl. 2. Combine all the other ingredients in a jar, close the jar and shake hard until all the ingredients combine. 3. Drizzle the salad dressing on the salad and then let it stand for 10 minutes. Toss once, after 5 minutes. 4. Throw in the capers. You can provide extra lemon if needed, but the salad is ready for eating as it is. How about a healthy salmon burger? 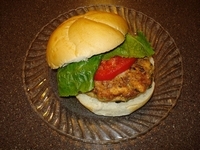 You will have avoided the regular red meat burger and you will have a delicious substitute. 1. Rinse and completely dry the salmon and then place in the food processor. Run it until the salmon is completely ground. 2. In a bowl, combine the panko, green onions, ginger, garlic, eggs, soy sauce and lemon juice, then put in the salmon and mix thoroughly. 3. Lay out foil and then divide the contents of the bowl into patties 1 inch thick. Cover with sarong wrap and set in the fridge for at least 30 minutes. You can leave them there for up to 8 hours. 4. Heat the vegetable oil in a skillet and then cook your patties. Be careful not to break them – turn once after 4 minutes and then again. 5. Serve on buns with lime mayonnaise and lettuce. If you are not sure how to make lime mayonnaise, there are plenty of recipes online. You may not know what panko is – it is breadcrumbs made the Japanese way. This is an excellent salmon recipe – low in calories and easy to prepare. – 6 ounces of sliced salmon, 1 inch thick. 1. Wash and pat dry the salmon and then season with salt and pepper. 2. Heat olive oil in a non-stick skillet large enough for the pieces to have enough room to cook. 3. Cook the salmon for 4 minutes each side and halfway during the process, increase the heat to burn the salmon a little bit. Lower the heat and then cook until the salmon flakes easily. 4. Put it on a platter and then put the tomatoes, the jalapenos and the butter on the hot skillet. Cook for one minute. Sprinkle this sauce over the salmon and then sprinkle cilantro. Your skillet seared salmon is ready to eat. 4 excellent recipes you can use to enjoy salmon. There are plenty more, but each time you cook salmon, you should take care not to overcook – it loses its appeal and doesn’t taste as good as when cooked just right. Are you concerned about commercially made snacks? If you are, you are not alone. A lot of people who are trying to stay healthy worry about the amount of sugar and unhealthy fats that are present in most of the snacks that you find in the supermarket. Most people resort to these snacks simply lack the time to prepare healthy snacks at home. Well, here are 11 health snacks that will take only minutes to prepare. You would be surprised at how many people are ignorant about the fact that they can make their own popcorn – they usually reach for the prepackaged stuff which usually contains too much salt and you never know what kind of fat was used. You can get raw popcorn at where you buy pulses and grains. – Put ¼ cup of popcorn into the paper bag. Fold across the top and staple along the fold. Make sure to stick to this amount of popcorn – more might strain the bag and tear while in the microwave. – Pop in the microwave for about 4 or 5 minutes. The pops will come fast in the beginning and then slow down. Wait until the pops are about 5 seconds apart – most of the corn has popped. – Take out the bag and add whatever flavors you wish. Add while the popcorn is hot – cold popcorn doesn’t take in flavors very well. 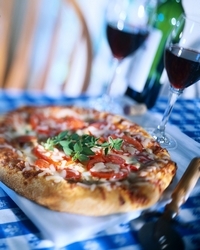 We all love pizza but it comes with too much to worry about – the calories go straight to the tummy and the hips, and eating too much of it can lead to obesity and other health problems. But because giving up pizza entirely is not really an option, here is a way to make a quick and very healthy pizza. – Split the muffin in half horizontally. – Put some sauce on each of the two halves. – Spread the 1/8 of a cup of the shredded cheese. – Pop into the toaster oven for about 5 minutes in medium heat. Do NOT use the microwave – you will not like what your pizza will turn into. Almost everything that you put on toast will set you back something substantial in calories. Well, avocado is one of the healthiest ways to eat your toast. It is low in calories, it is a great source of fiber and it contains only healthy fat. For this recipe, just toast some bread and then slice some avocado over it. You can add some salt and squirt a little lemon juice on for more flavor. This is an excellent snack as well as a great solution for a quick breakfast. Again, there is very little to be done here. Buy some of your favorite healthy yoghurt flavors and keep them handy in the fridge. Buy some of your favorite nuts – you can select several different ones, but they should be salt free. Any time you feel hungry, scoop some nuts into the yoghurt and you have a healthy, cheap and easy to prepare snack. Not many people think about different options for apples. There are great things that you can do with them if you get creative. One the best is to slice the apples in to thin slices and then bake them slowly dry. All you need is a food processor. You don’t have to peel the apples, just get very thin slices out of them. They take about 2 hours to bake perfectly so you can leave them on as you make dinner and they will be excellent for tomorrow’s snacks. Mix it all up in the food processor and then put in a bowl, cover and set it in the fridge. This recipe serves 4 but you can make more to last longer. These are a great replacement to regular fries and this recipe uses brown sugar to make them particularly delightful. – Preheat your oven to 4500F. – Peel the sweet potatoes and slice them into chips. – Place them in foil together with the sugar and the olive oil and toss a little. – Arrange them so that there is lots of room between the slices. – Bake for 15 minutes, turn with tongs and bake again for 15 minutes. Popsicles are among the most common things to snack on in hot weather. The problem is that store bought ones come with more calories than is healthy. There is no reason why you cannot make your own popsicles. All you need is a fruit and the fresh juice of the fruit. Blend the fruit a little, mix in the juice and then pour into popsicle molds. Wait about 30 minutes until they become slushy and then insert the sticks. They will set just right. We all love corn and here is a way to make it even better without piling on calories. Simply boil the corn and then coat it with parmesan cheese, stick in the microwave for a minute for the cheese to melt and you have a great snack that is low in calories. Corn is also great for fiber and it keeps you feeling full for a while. This one gets all your fruit together and is incredibly easy to make. You need to have a banana, a handful of raisins, ¼ cup of grated coconut and a tablespoon of honey. You can mash up the banana or you can slice it into a bowl. Add the raisins and sprinkle the grated coconut. Spread the honey on top. Less than 5 minutes and you have a vitamin packed snack. – Wash the kale and the strip off the thick stems. – Arrange them flat on foil paper. – Drizzle with olive oil and salt and then bake until the edges turn brown – usually takes between 8 and 10 minutes and your kale chips are ready to serve. There you have it; 11 healthy snacks that you can make on the quick and that are also pretty cheap. If you really cannot spare the short time that it takes to prepare these delicious recipes, eat fruit and nuts for snacks rather than going to the vending machine or buying snacks in the supermarket. Is Aspartame a Safe Synthetic Sugar?